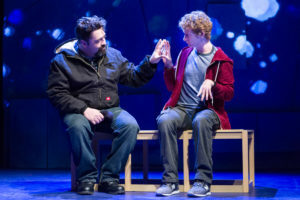 Mixed Blood Theatre has just opened “The Curious Incident of the Dog in the Night-time,” and what a fascinating show it is! And on so many levels! Here’s a thought-provoking story that elucidates an enigmatic protagonist, supported with a theatricality grounded in a clear purpose. This is how live theater is supposed to work. A best-selling novel first, the adaptation for the stage by Simon Stephens has won a long list of prestigious awards, including five Tony’s. First, the premise. “Christopher” is a 15-year-old math genius, somewhere on the autism spectrum, living in Swindon, England. The inciting (and “curious”) incident is the death of Wellington, a neighbor’s dog. Christopher sets out to solve the mystery, pestering all the neighbors in the process, and subsequently unearthing a far more profound mystery that he didn’t know needed “solving.” What happened to his mother? Christopher’s prickly exterior is also part of his charm, stemming from his compulsion to be honest. This characteristic helps the play connect its audience with larger issues, too – the ones that face all of us – with Christopher creating a kind of order by just sticking to this one simple principle. “I can’t lie,” he says, and, in fact, he even dislikes metaphor because they’re lies, too. That kind of sitcklerism. “It’s going to be all right” … “I promise you” … and “trust me,” his parents tell him. Repeatedly. He wants to believe them, but can he? Absolutely? Herein lies Christopher’s impossible dilemma. MacGregor Arney as Christopher is simply miraculous. Director Jack Reuler met him as a graduate student at the University of California in San Diego, and what a find! This young man brings a beautiful balance of intensity and geniality to the role. I believed he was Christopher – every minute. His father Ed, played by Zack Myers, is a down-to-earth sort whose straightforward responses to his son’s peculiarities have brought stability to the boy – until Ed’s life comes unhinged, sending him temporarily over the edge. Myers is another standout in this production, deftly managing a range of conflicting emotions without ever slipping into the beyond. The boy’s mother, Judy (Miriam Laube), is admittedly less capable of dealing with Christopher’s issues, and excuses herself from parenting until essentially forced back into it. Laube is clearly a skilled actor, but tended towards a melodramatic style that didn’t quite fit the contemporary nature of the show. I was a little distracted, which impacted my perception of her character’s relationship with her son. His teacher Siobhan, played by Regan Linton, is the savior in the crumbling eco-structure that Christopher desperately needs if he is going to survive. She not only understands him, she takes great delight in supporting his talents. Linton is spot on in this role. She appears unflinchingly in Christopher’s corner, giving her mentee’s extraordinary gifts wings without a whiff of patronization. When he asks his teacher questions about what he can do, she responds truthfully in a way that he’ll understand, and so do we. Absolutely solid acting – and writing. Right in the pocket. A versatile ensemble of five additional actors played an array of characters, doubling as well as “stagehands” beautifully integrated into the action of the play. The choreographed set-shifts and implementation of props solved the practical issue of a zillion set changes. But it also served to illuminate Christopher’s place in his environment, cluttered with people who might touch him and send him into a panic. Jack Reuler directed this production, supported by designers Kathy Maxwell for video; Karin Olson, lighting; Joseph Stanley, set; and Abbee Warmboe, props. I mention the creative team because the technical elements function almost as additional characters. You’ll be dazzled, and maybe a little annoyed, too. Well, welcome to Christopher’s World. I know the play is award winning, but … it’s a bit too long, not in terms of minutes, but because it sometimes has a hard time finding its way out of things and keeps on going until it does. The beauty of the play is that it’s generally Christopher who stops the nonsense and brings it back into focus. This play has been criticized for being sentimental, but I say, “don’t call it sentimental.” It’s a show with genuine heart and a worthy theme. And, yes, there is an adorable puppy. So? The moment is theater magic, not because of the puppy, but because of where it happens in the play. We are completely invested in this boy by this time, and delighted to tears – finally! What a payoff! You’ll cheer for him, and don’t be embarrassed by that. Go cheer for him! Yay for Christopher, you brilliant boy! Can he do it? Can he? … What do you think?